If you are sharing your desktop usage but don’t want other to have chance to mess up with your confidential files, it would be good to always lock the sensitive folders using My LockBox or Hide Folders. Alternatively, users can choose to track those folders/directories in case there is any change including deletion, modification or addition of new files into them. That is how this useful software utility can come handy with. 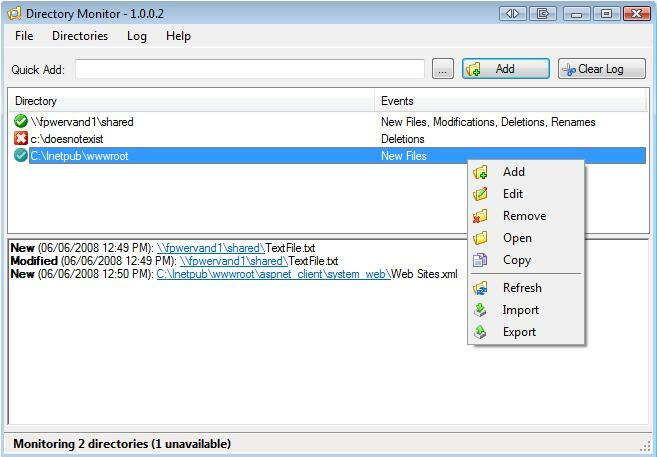 Named as Directory Monitor, it allows users to monitor local drives and even network drives and log down the changes with simple setup. For the start, users can selectively add a specific directories to be monitored. Besides, there are some simple settings that allow users to customize the respective folder checking, refresh directories and show balloon tips intervals, perform the monitor log backup as well as ignore certain file patterns as preferred. Some other features including the ability to execute an application when a certain event occurs which could be useful for some automated tasks. One drawback, it requires both .NET Framework 3.5 SP1 and Windows Installer 3.1 in order to work correctly. If you think this is useful, just go here to download one for immediate use.